Personalized New Baby Blue Teddy Bear - 8"
An adorable baby blue teddy bear to welcome you newborn baby is a great way to announce his arrival. This Personalized New Baby bear makes a great gift for Mom, Dad, Grandma, Grandpa and of course for baby himself. This new baby design is featured on our Blue Timothy Bear. Our Blue Timothy Teddy Bear features embroidered eyes and mouth to make him safe for all ages. He is handmade, surface washable & measures 8" tall with a satin blue bow tied around his neck to give him an extra handsome touch. This bear wears a t-shirt that can be personalized with any custom message. Just follow the simply steps below to begin! Free gift wrapping and a free gift message are also included to create a thoughtful presentation. Blue Timothy Bear - 8"
The product and price were perfect. The web site was easy to use. all in all a very positive experience. 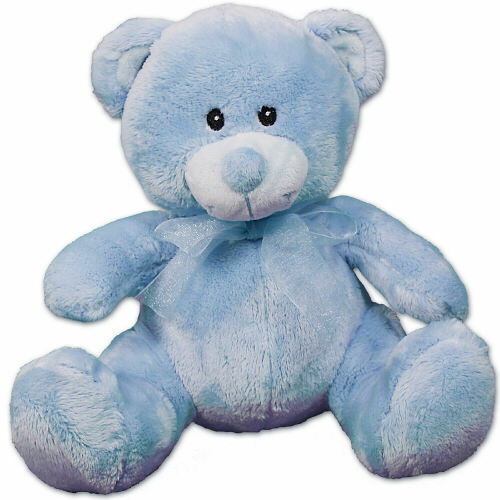 Our Blue Timothy Teddy Bear features embroidered eyes and mouth to make him safe for all ages. He is handmade, surface washable & measures 8" tall with a satin blue bow tied around his neck to give him an extra handsome touch. Free Gift Wrapping and a Free Gift Card are also included to create a thoughtful presentation. Additional Details Browse through our complete collection of New Baby Plush Animals to find all your newborn baby gift ideas. 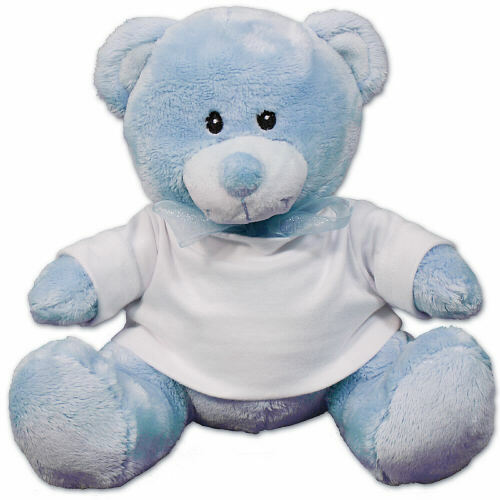 You'll also enjoy our Embroidered Blue Bib Teddy Bear & our Embroidered Peek A Boo Bear as well.